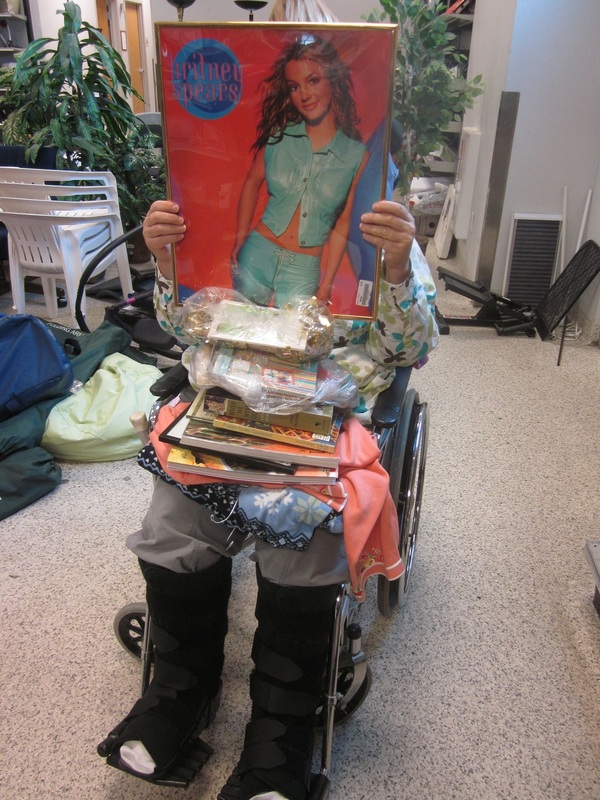 Here’s Deb, in her wheelchair, with her giant boots, just ten days after her (elective) foot surgery. She made a great shopping cart, and we still had a blast. We decided that if anyone got in our way, she was going to stick out those boots and become a battering ram. The Britney Spears poster was really not going home with us, but it made for a funny photo, and we do have to admit that the rest of the stuff on her lap did make the trip to our respective abodes. Now that the personal stuff is out of the way, on to the post. Christmas shows many faces to the world, and not all of them are pretty. In this post, we have a few real losers that made it onto our lists, and shouldn’t deck anyone’s halls. We are pretty sure he has been hitting the beach to get that color. Either that, or there is a salon in town with a very big order going in for a restock on spray tan. There is enough facial hair there for a couple of cockapoos with some left over. He actually does look a little doggie-like. I am beginning to think we need a whole category for macrame fantasies, as you name it, I guess someone, somewhere, macrame-ed it. What really got us here is the packaging. We don’t know why, but you leave some old decoration in its original packaging, and we go crazy over it. Must have something to do with that romancing of “better” days. Anyone who has read our blog for a while, knows we don’t really buy it, but the ads sure do a fine job selling that bill of goods. We loved that it was all still there, even down to the alternative “flames” for use at Christmas. I don’t know why the red and green ones were not considered Christmasy. Do you use those for Thanksgiving, or maybe Easter? What is this? 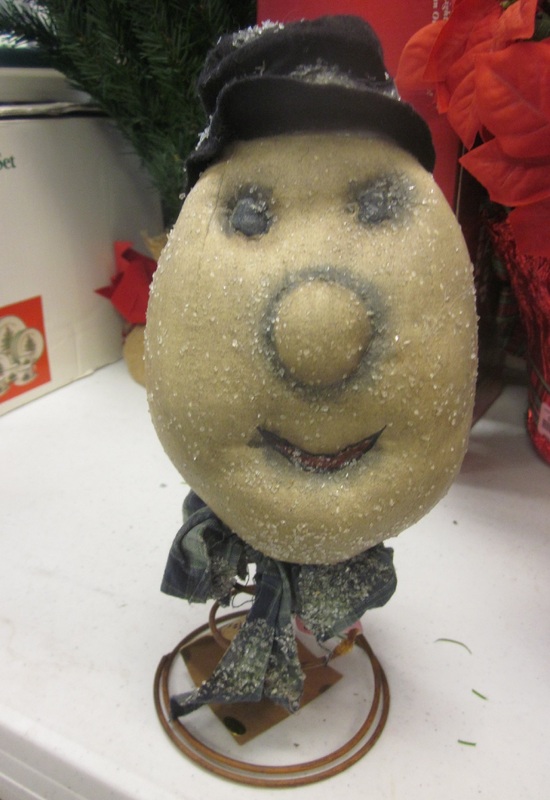 A moldy Mr. Potato Head? A snowman who survived a massive sand storm? Whatever it is, festive is just not a word I would use to describe it. Maybe if you hid it behind the tree you could stand to have it around. And it had better be a really big tree, so not even a glimpse could be seen. 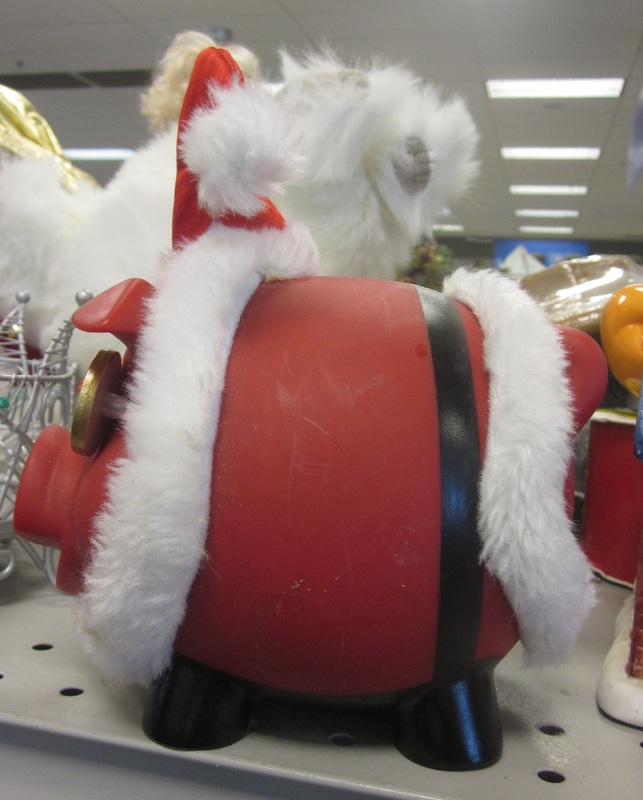 It could make Santa reconsider that coal. 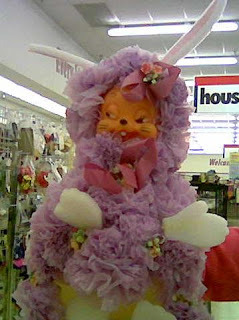 After the porcine phantasm, you deserve to be left with something cute. 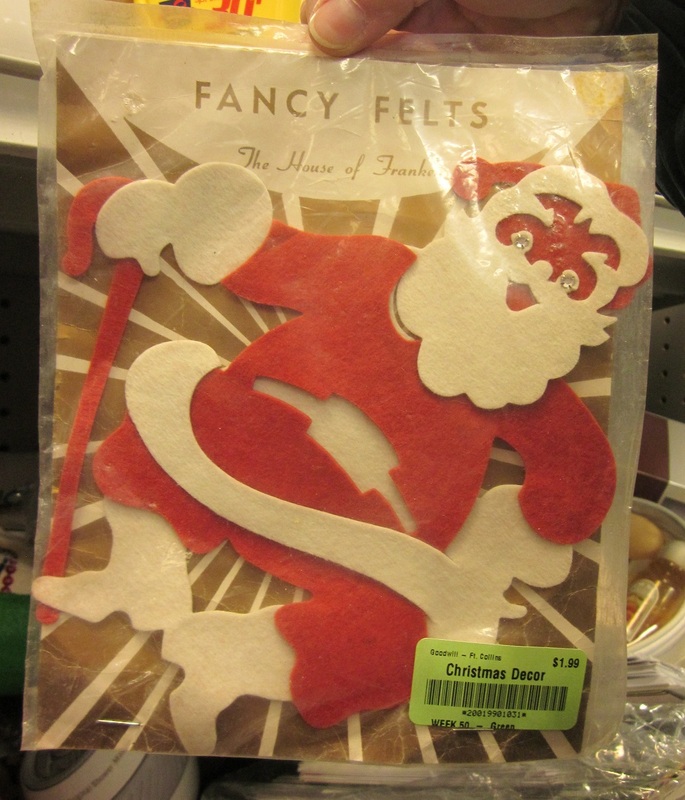 How about this fold-out Christmas card holder? 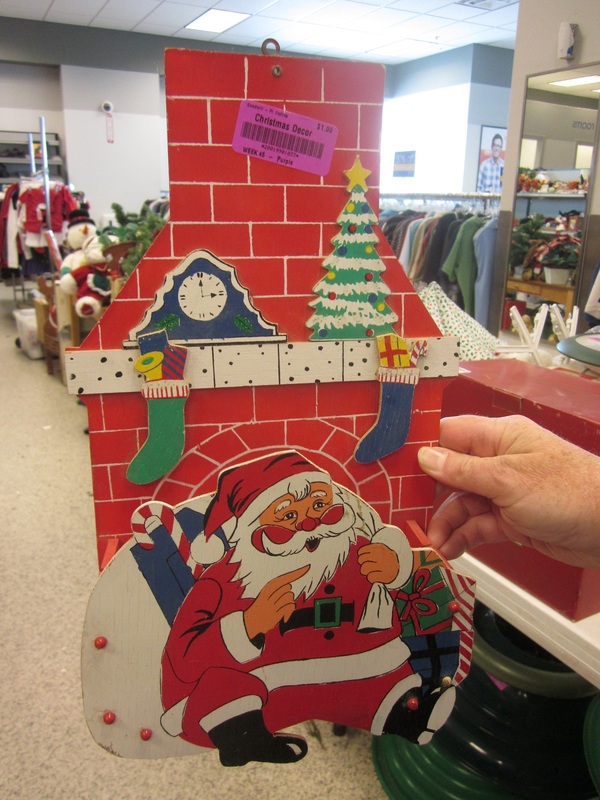 This was a cute wooden box that folded flat for storage, and popped up to keep those cards organized. It’s all that says Christmas and a fitting face to leave you with. Even more Christmas coming next week. Head over to our Facebook page this week for a fun Christmas giveaway. This entry was posted in Friday Finds, Holidays and tagged Animals, Crafts Gone Wrong, Holidays, Kitchen items, Macrame, Yarn Play. Bookmark the permalink. 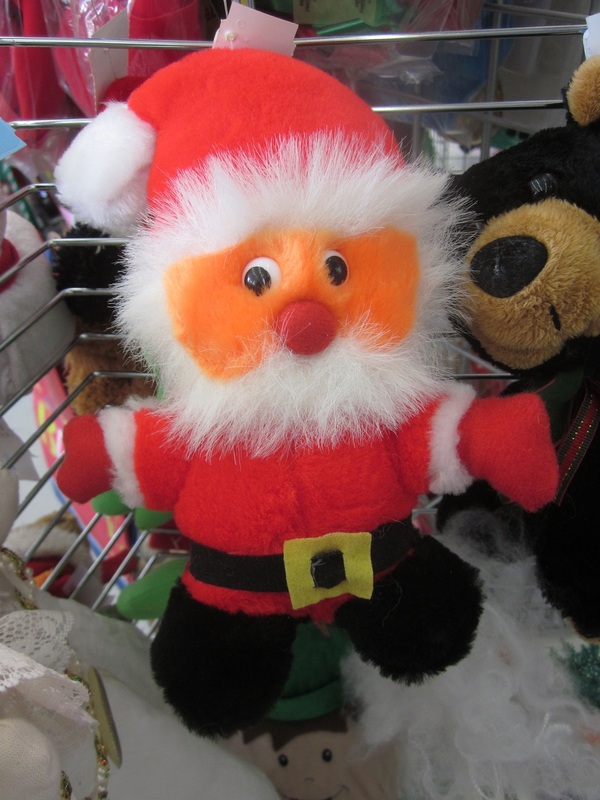 I like the photo of Spray-tan-Santa because he got photo-bombed by a stuffed bear. That’s so funny—we never noticed the bear!! We had that EXACT same card holder when I was a child. I think my youngest sister might actually still have it. It was one of our FAVORITE things. I love it when I see something from my childhood–that has good associations. At least you could visit it at your sister’s house. I shared this on Facebook & Cindi confirmed that she still has this. I told her to check the blog out. LOTS of fun memories in the stuff you ladies find. Yay, glad it’s still in the family–and thanks for telling sis about us! You’re welcome–we’re glad you joined in on the fun! It’s more fun to shop together, even if it means pushing a wheelchair! Gracious! 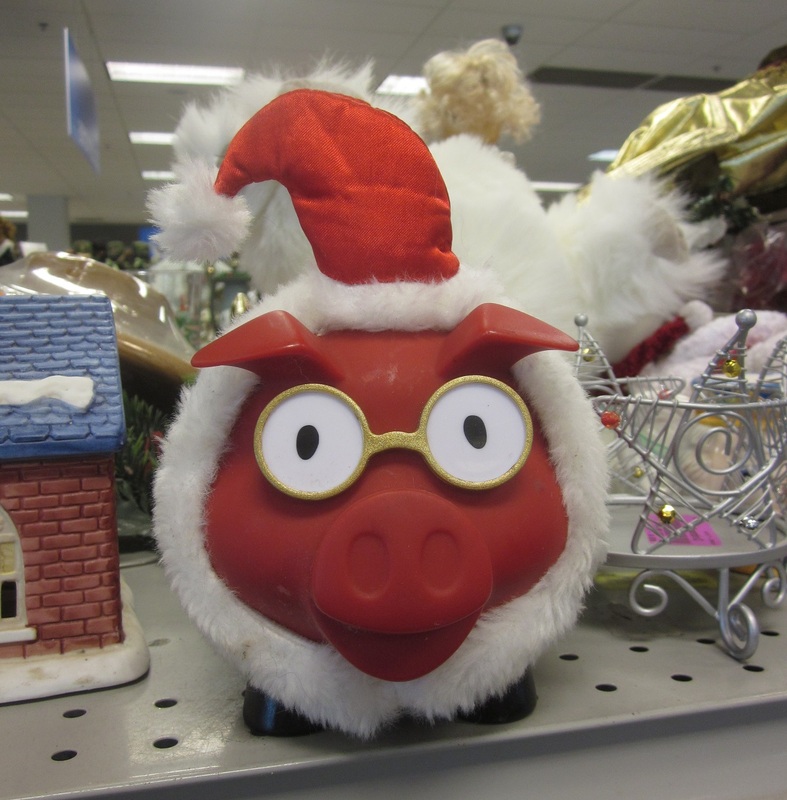 A Christmas pig! Now I have seen it all! I’ve had such a cackle reading this post – thanks for sharing your amazing finds – and wishing a speedy recovery to Deb! 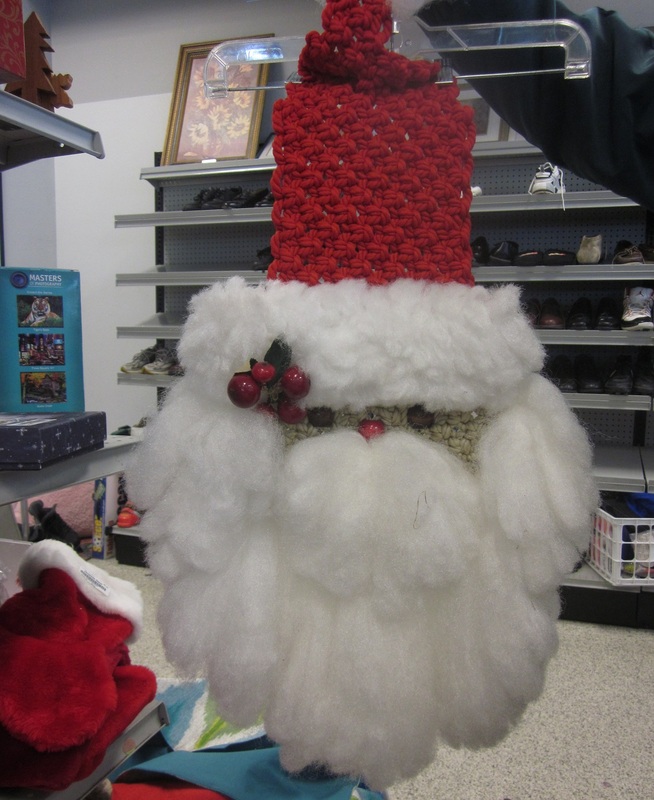 Saw the large macrame santa face vintage wall hanging.I made over 30years ago but forgot how to make .Looking for the instructions to make.It had a tan face white beard red bead and black beadsfor nose and eyes and ametal fing on hat top. Sorry, we just took the picture, we don’t have a pattern. Maybe there is one on Pinterest. We only took a picture of the Santa.